These white touche covers are some of the most elegant covers available on the market. With a rose-petal-soft finish, white touche covers are sure to set your reports apart. These 13pt covers have a fine, velvety tactile surface, luxurious matte finish, and extreme durability. Additionally, white touche covers can be easily offset printed, silk screened, foil stamped, embossed, scored, folded, die cut, or glued. We also offer these covers pre-punched in the binding pattern you prefer (see list below). Be sure to select the right color and size as we carry a wide variety. Welcome to MyBinding Video. These are the 13pt. 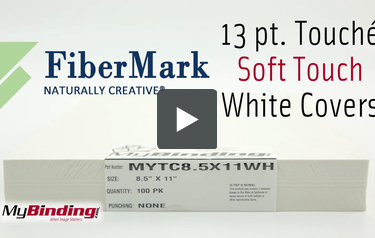 Touche Soft Touch White Covers from Fibermark. These covers grab my attention as soon as I touch them, every time. They’re perfectly clean white and have almost no reflection at all. At 13pt. thickness, they’re very flexible, but the texture is what sets them apart. Described as velvety, luxurious, and rose-petal-soft, it’s difficult to describe how gentle this texture truly is. We can even customize these covers for you with offset printing, silk screening, foil stamping, embossing, scoring, folding, die cutting and glueing. These covers are available in a variety of sizes, in the punching pattern of your choice. For more videos and all your binding needs, visit MyBinding.com.